competitive exam. These Anganwadi Female Supervisor, Anganwadi Karyakarta Female Supervisor vacancies are reserved for the female candidates of Madhya Pradesh State. Interested and qualified candidates can apply online from 21-02-2017 through the Madhya Pradesh VYAPAM official website of @ www.Vyapam.nic.in. Last date for submission of application forms online is 07-03-2017. 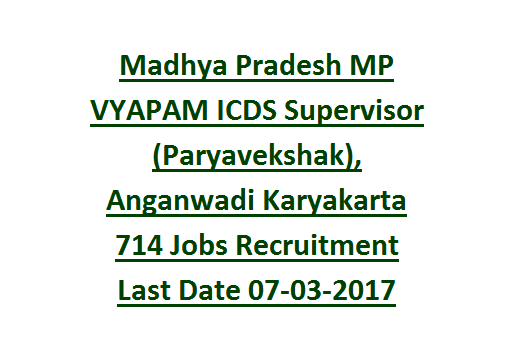 There are total 714 ICDS Anganwadi Female Supervisor, Anganwadi Karyakarta Supervisor Jobs available in this Madhya Pradesh VYAPAM Women and Child Development Dept Recruitment 2017. For more information about MP VYAPAM Female Supervisor, Female Karyakarta Jobs category wise vacancy details, online application, Exam Pattern, syllabus, application fee details and more is given below. There are total 714 vacancies available in this Supervisor posts of Akikrit Bal Vikas Seva Department. Upper age limits for MP State Female candidates is 45 years and for candidates belongs to other than MP state for them upper age limit is 35 years. For Anganwadi Supervisor Posts-Degree from a recognized university. For Paryavekshak Mahila Anganwadi Karyakarta-12th/10+2/inter/HSC qualifications is required and 5 years of experience as a Anganwadi worker. For General Candidates Rs.500/- and for other Rs.250/- for one post. For both posts Rs.700/- for general and Rs.350/- for others. Selection for these vacancies will be based on written tests only. Written test will be conducted for 200 marks and exam duration is 180 minutes. Total 200 questions will be given each question having one mark. Exam paper will be in Hindi/English. Objective type multiple choice questions will be given. 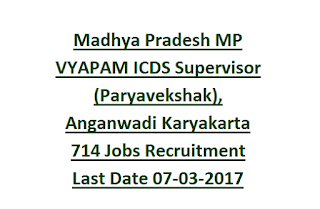 Download notification here for ICDS Balsevika Anganwadi Supervisor Jobs in Madhya Pradesh. Kya mp aagenvadi superviser exam other state k log b de skte h?